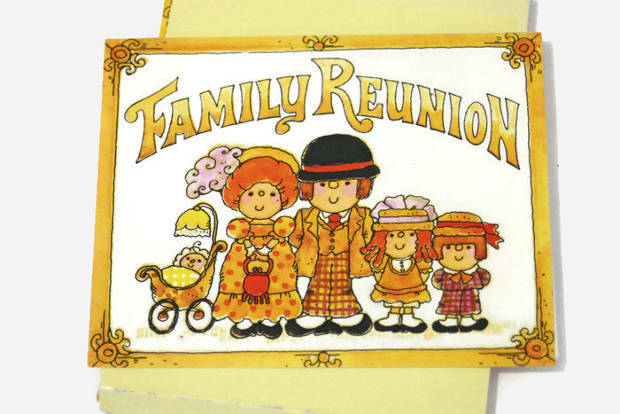 Family reunions are rare occurrences and that’s what makes them important for so many people. 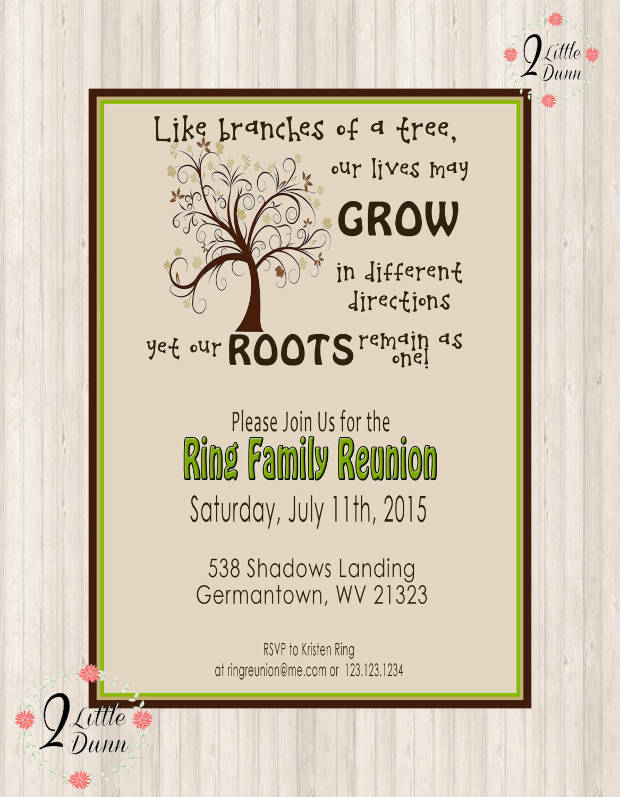 These reunions require a party and the proper party invitation designs. You can follow a certain theme or a family tradition. You can also find a design that aims for humor in order to start off the party on a pleasant note. 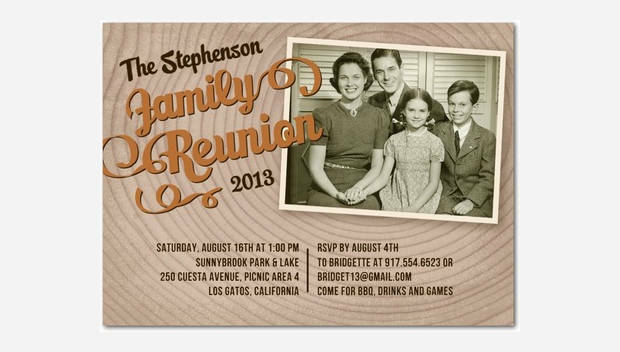 No matter what you choose make sure that you check out the following collection of family reunion invitation. 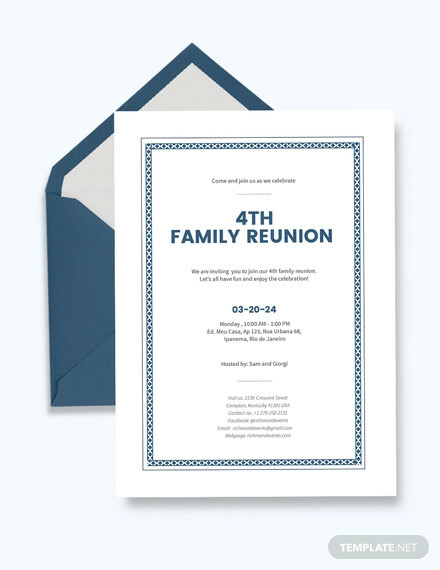 Printable designs are ideal choice for those that want to send out their invitations via post. Also it is a great solution for the relatives that are not familiar with the digital world. Choose a fun design to set the mood. 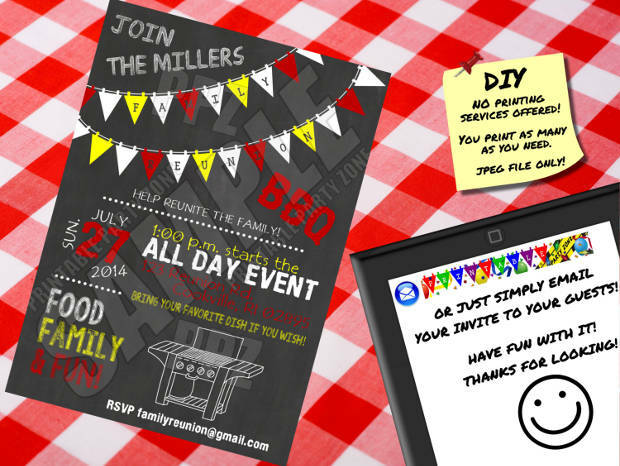 You can make your own family invitations with easy and fun ways. You can choose the background design through collections in the web and by using the right fonts you can type them on your own adding details and text. 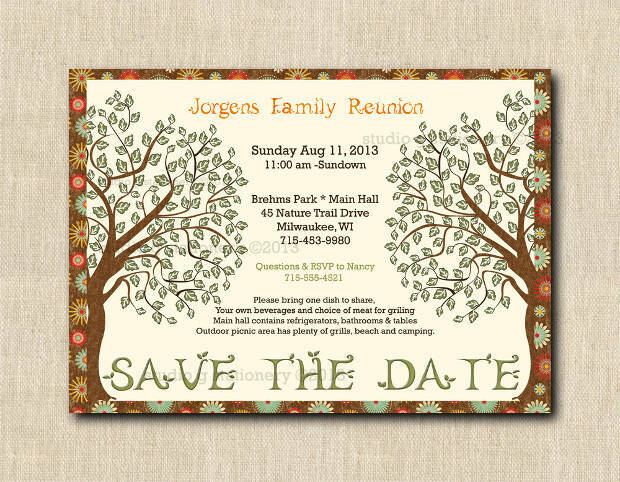 Handmade designs can give you a personal touch making the invitations look stunning. 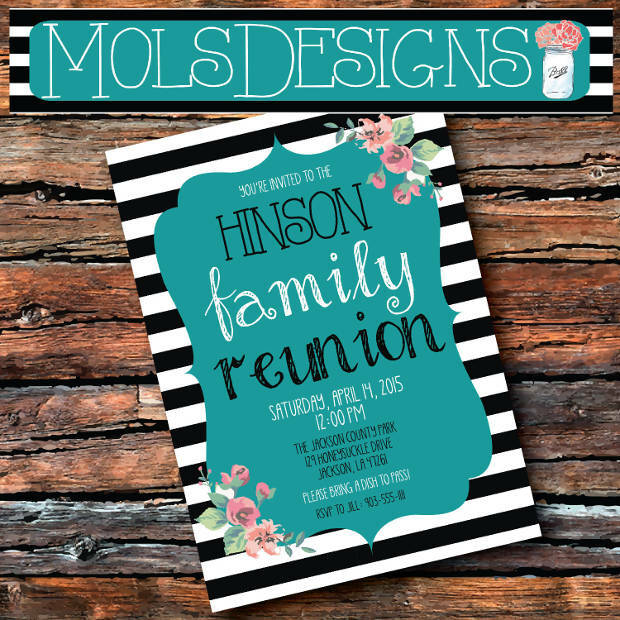 You can find many designs that feature elegant fonts and incredible graphic designs that will add a sweet look to your invitations that will be truly memorable. 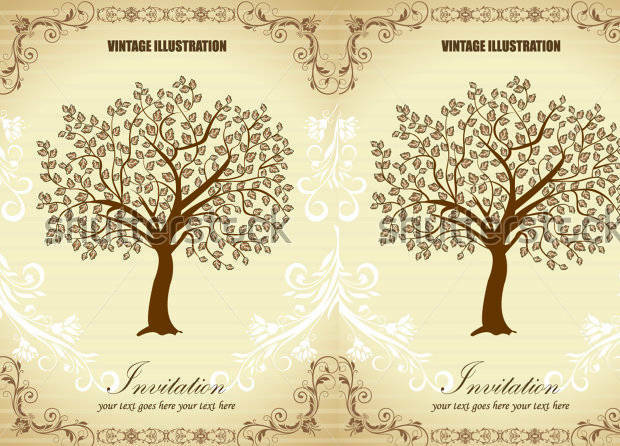 Sample invitation designs can give you a canvas where you will create your own invitation designs. This way you won’t have to wonder for hour about what to write and you will still have an amazing look for your invitations. Starting the party on a pleasant tone is going to set the mood for everyone. 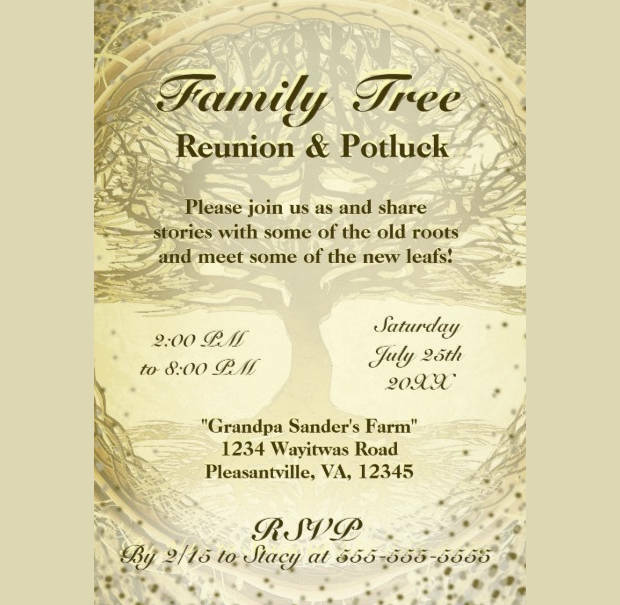 You can find many invitation designs that have smart and funny quotes and poems to help you create a humorous invitation for your family reunion. There are invitations that allow you to insert your own photos. This is going to make your designs look stunning as well as personalized. You can choose old photos from past reunions or from other occasions to add extra character. 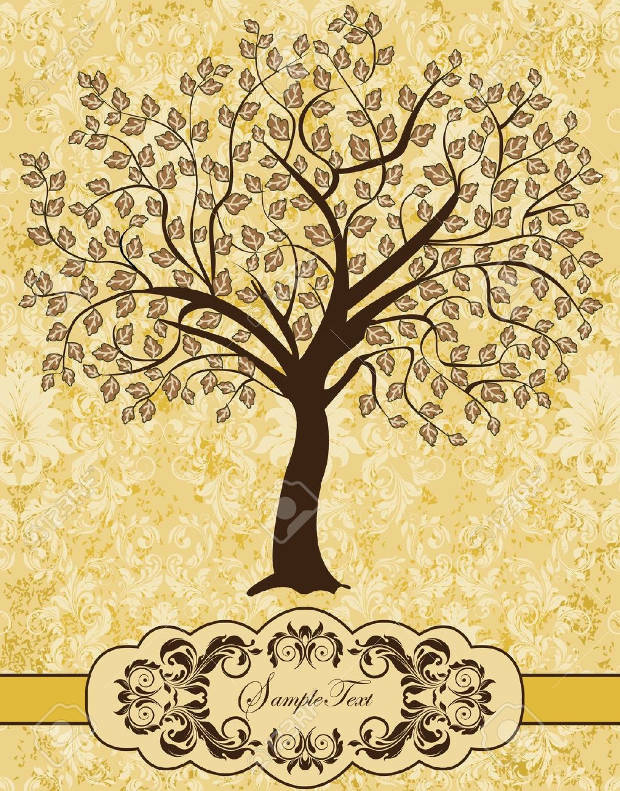 A vintage design is going to look stylish and different from the ordinary. 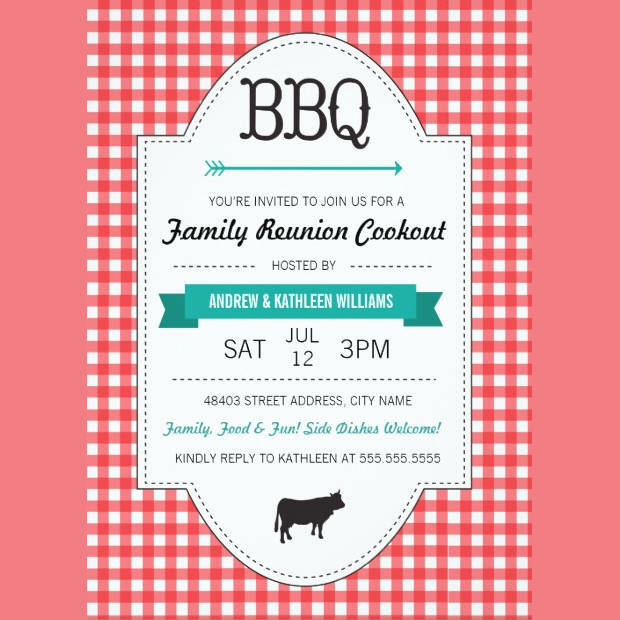 You can choose a design with beautiful borders and stunning graphics that will add a pleasant and fun note to the designs making everyone accept your invitation. The chalkboard effect is going to give you a retro design with a slightly grunge tone. These designs have elements of dramatic design making it look beautiful and stylish. You can choose a design a fully editable format for customization. 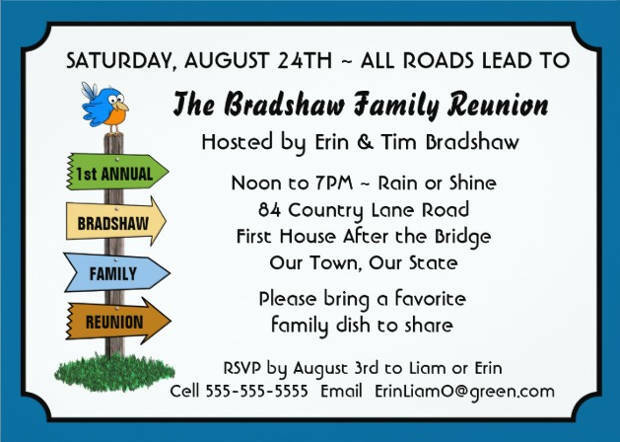 Family reunion invitations are useful in many ways. 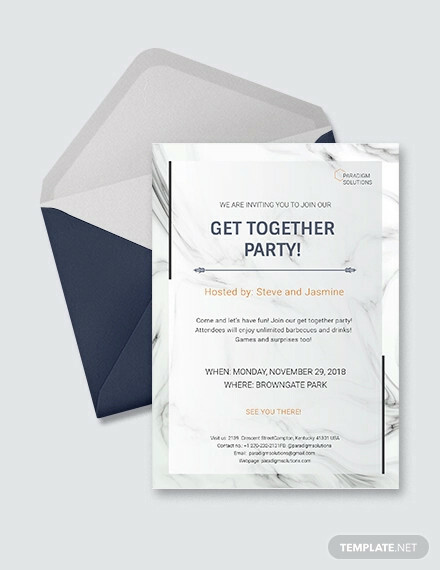 Firstly they allow the hosts to prepare properly for the event by sending these invitations in advance and to set the right mood for the partygoers. 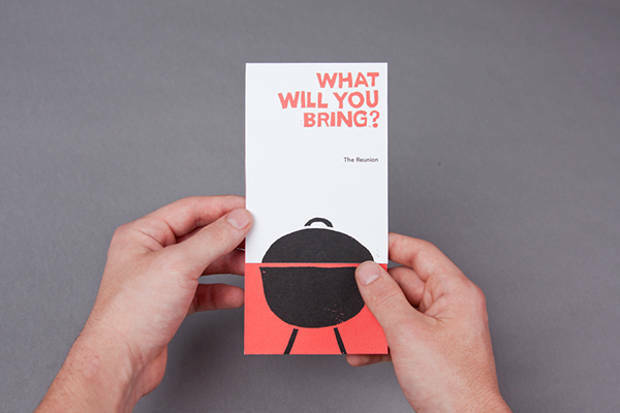 Secondly with a well designed invitation the recipients are going to get informed for the event as well as start preparing for it in an exciting note. 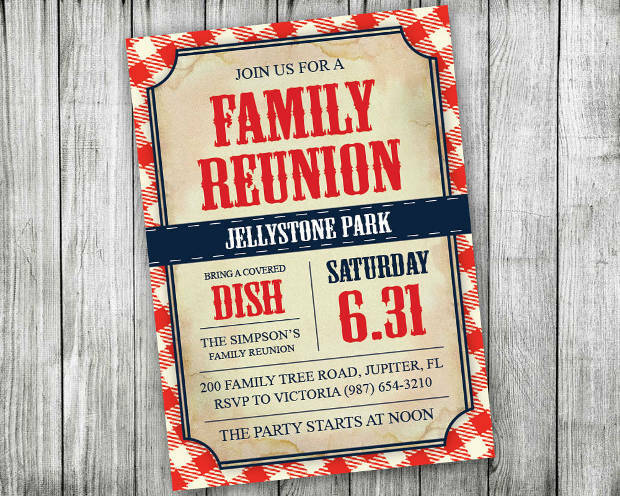 This is going to guarantee the success of your reunion party event with family. 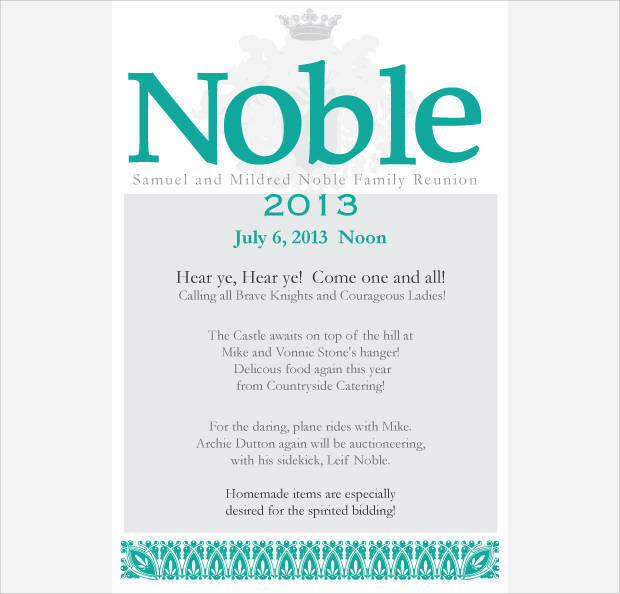 The invitations have to follow the party’s theme closely. 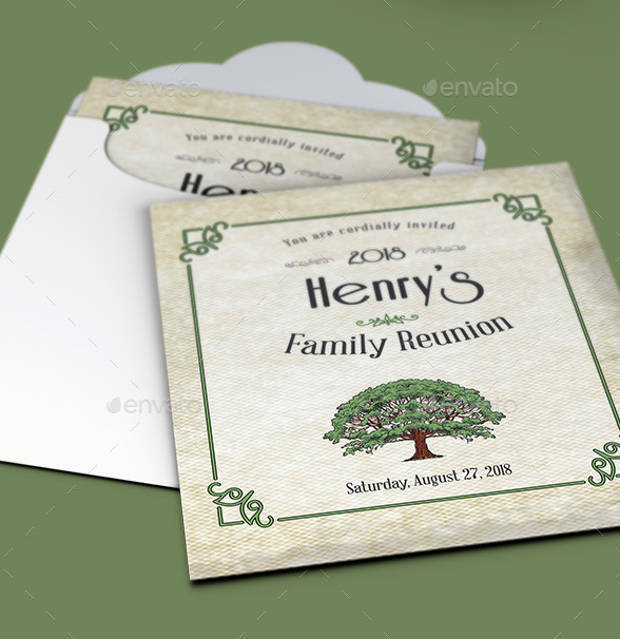 You can have a barbeque party or a tea party with the suitable tea party invitation designs. Make sure you give time to your guests in order to prepare too for it in order to attend and enjoy your event better.